How do we Draw Fans to the U.S. Open Cup? Last night, FC Dallas hosted the Philadelphia Union in the semifinal of the U.S. Open Cup. The game started slowly, but a Union goal early in the second half sparked the match, which eventually went to penalties. Philly won, and they will host the final in early October. This was a big deal. But if you happened to tune in to the game, you probably saw something like this. Now, it’s not nearly as bad as it looks. FC Dallas did not sell tickets for that side of the stadium, and so the other side, the one the camera doesn’t see, was well-populated. But even with this, the crowd couldn’t have been much larger than 5-6,000. For a cup semi-final. And that is not exactly an outlier. When Major League Soccer teams host Open Cup matches, only a select few can draw more than 10,000. That’s not good. At some level, crowds like this are understandable; Open Cup matches are played on weeknights, and many clubs, Dallas included, have suburban stadiums that are hard to get out to. No matter the match, weeknight crowds are smaller than weekend crowds there. The New York Red Bulls play in Harrison, New Jersey, and they average more than 18,500 fans per game. But when they demolished Houston on a Wednesday night in April, just 13,278 showed up. In England, FA Cup matches are played on the weekends. Why don’t we do that? Because it would solve one problem but create another. Cup games on weekends would force regular season matches to weeknights. That wouldn’t sit well with away teams who lost a big weekend crowd. 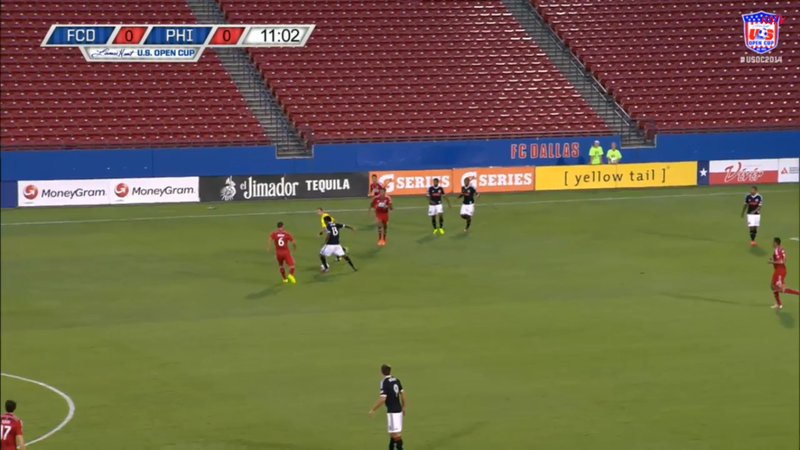 And even that small Red Bull crowd more than doubled the one in Frisco on Tuesday. The Open Cup’s problems are more deeply rooted. It is not true anymore that soccer is foreign to the United States. The World Cup proved, even to the most ardent doubters, that we understand soccer as a spectator sport. But having said that, some aspects are still very foreign. Try explaining to the average American sports fan that MLS teams play in a tournament with minor league teams during the regular season, and I’m not sure they’d follow. And most MLS clubs are still relying on the casual fan. In many cities, the majority of people showing up on a weekly basis aren’t season-ticket-holding diehards. So you have weeknight games that some fans don’t understand the significance of, that are scheduled on fairly short notice, and season ticket holders sometimes don’t get tickets to cup matches. No wonder attendance is low. But beyond a lack of understanding, the Open Cup suffers from a lack of exposure. One of the things that has been vital to the survival and success of MLS is that the league has always had a national television contract. That means air-time for games, but also highlights, casual mentions, and general exposure. Even non-soccer fans know what MLS is at this point. Open Cup games are not televised, even locally; me and a few thousand watched last night’s game on Youtube. As such, networks have no incentive to advertise upcoming Open Cup matches, and that duty falls to clubs. Advertising for the Open Cup is often spotty as a result. Many clubs could improve on this, certainly, and maybe crowds would grow. What the US Open Cup needs, more than anything, is coverage. Television coverage, even if just on local networks, would be a huge boost for the tournament. It would behoove US Soccer to try and get broker deals with networks, even if just for late-round matches involving MLS clubs. I don’t know what the potential audience would be for, say, a Tuesday night semi-final between Dallas and Philly. So at some level I am suggesting networks spend money that isn’t mine. But I am nothing if not an idealist. And in my ideal world America’s longest running cup competition can sell out a semifinal match.